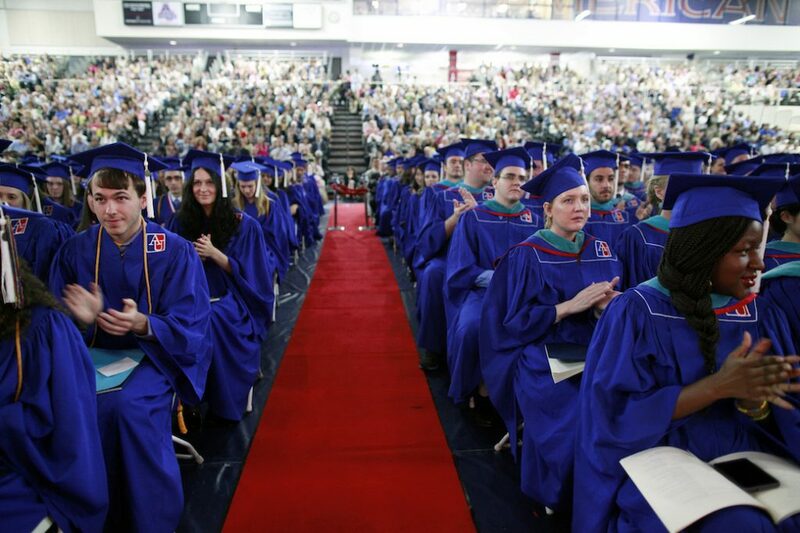 Critics often point out that college accreditors are overly focused on bureaucratic process and do not pay enough attention to students’ measurable educational outcomes. That’s a serious concern, as accrediting agencies are the gatekeepers tasked with determining whether colleges offer the level of quality necessary to receive nearly $120 billion in federal grants and loans each year. However, accreditors do much more on student outcomes than most people realize. A CAP analysis shows that accreditors already have many of the tools needed to adopt a more results-based approach, although ensuring that all accreditors adopt such an approach demands a sizeable mentality shift to make better use of the tools currently at their disposal. Most accreditors collect numerous outcomes measures every year, including enrollment and graduation rate data. Processes and results differ between regional agencies, which mostly oversee public and nonprofit colleges, and national agencies, which mostly oversee career-focused for-profit colleges. Among regional agencies, however, the expectations that accreditors lay out in their standards vary widely. Moreover, the data these agencies collect are not well connected to standards. Accreditors can only take action against an institution if it violates one or more of their standards. 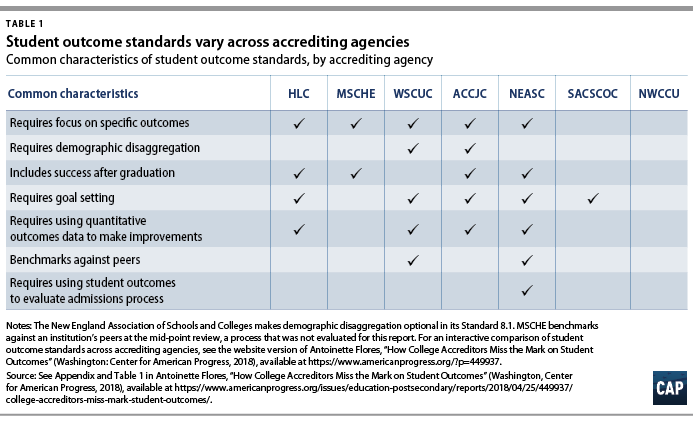 Therefore, if they have concerning data about a college, but nothing in their standards connects to the measure in question, they aren’t taking the data into account when considering whether the college should be accredited. 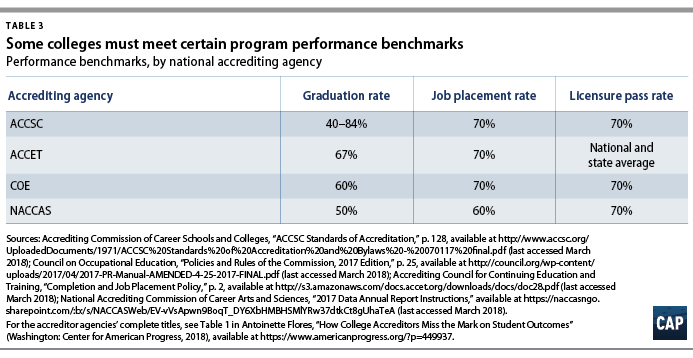 National agencies collect data down to the program level and at least ostensibly require colleges to meet minimum benchmarks to remain accredited. Performance benchmarks set a clear line of what outcomes are acceptable, but the actions an agency takes when a college underperforms can undermine accountability. For example, when a college underperforms, some agencies take a hard line, while others allow institutions flexibility in explaining their performance. As a result, some institutions may be given considerable leeway and can remain accredited—even if they don’t meet minimum performance benchmarks. Require collection and analysis of common student outcome data across accreditors. Variation in what data are collected makes evaluating overall performance and drawing comparisons across institutions difficult. 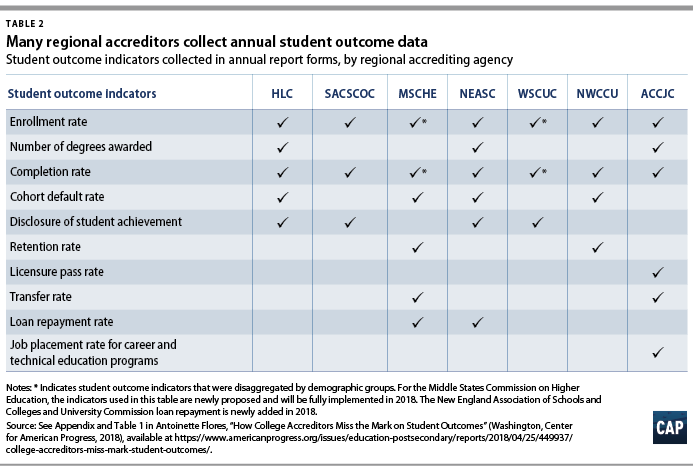 Accreditors should agree upon what student outcome data to collect as a standard measure of quality across all agencies. These data may vary by institution type or mission but should include multiple indicators that capture how students fare while they are enrolled and after they’ve left. Include equity in data collection. Measuring institutions’ overall performance is not enough to ensure it meets quality standards. Accreditors should require institutions to disaggregate performance data by demographic groups—including at least race, income, and gender—and ideally attendance status and whether students require developmental education. Better connect standards and annual data collection through clear performance expectations. Agencies should revise their standards to articulate clear performance expectations. This does not necessarily mean accreditors should have bright-line standards that automatically lead to a loss of federal financial aid when a school falls short. Rather accreditors should create a standard that automatically triggers an in-depth review or a shortened accreditation cycle if institutions fail to meet it. Benchmarks should be established for measures beyond completion rates such as loan default and repayment. Accreditors should ensure that colleges will be judged on the annually collected data. Establish processes for data collection and accountability for low-performing colleges. Accreditors must agree on what happens to colleges that fall below established benchmarks and define a consistent timeline for colleges to show improvement. Require accreditors to have benchmark standards on defined student outcomes. Legislation should define the student outcomes on which accreditors should have standards, such as graduation rates and student loan repayment and default rates. These standards should clearly define the adequate level of performance as well as the agency’s process when performance is not up to par. Create loan repayment rate and default minimums. Policymakers should further bolster accreditors’ efforts by creating performance benchmarks on outcomes specifically related to federal aid, such as student loan repayment rates. The existing cohort default rate measure should be strengthened; using repayment rates may help solve some of the problems with the measure. Create a federal student-level data system (SLDS). Creating a federal SLDS would make it much easier for accreditors to collect and use disaggregated student outcome data. A federal SLDS would capture more accurate and complete student outcome data and decrease both the burden on colleges reporting data and the need for low-resourced accreditors to actively collect data.